Freyja means Lady, Sovereign. 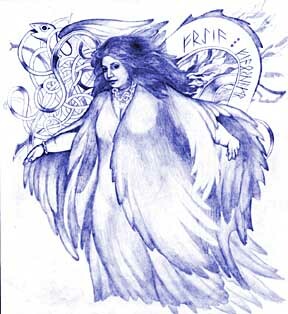 She is the Vanadís, ancestral Mother of the indigenous Vanir. She blesses the living and the dead, whom she escorts in the form of a mare to her rich-seated hall, Sessrumnir. The Scandanavian great Goddess flies across vast distances when she puts on her shamanic robe. She often takes the form of a falcon, sow or mare, or rides a goat, or in a chariot drawn by cats, or travels the lands in a ship. Another of Freyja's treasures is a brilliant necklace made of the sun's tears, the Brisingamen.